Forexearlywarning conducts online forex training seminars that cover the entire trading system, as well as trade entries. 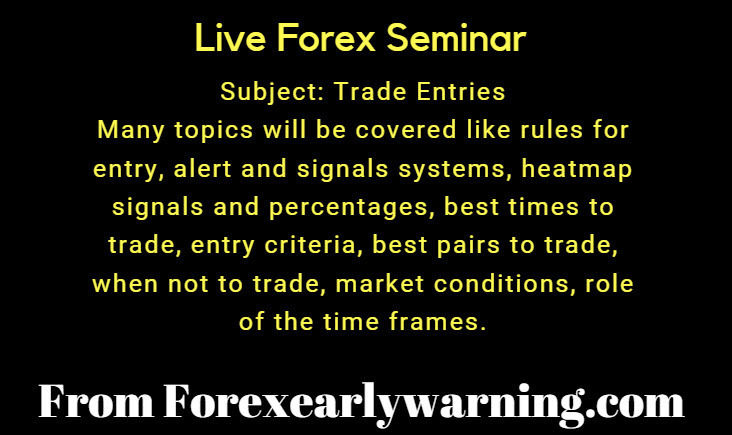 Forexearlywarning will conduct a 90 minute online forex seminar on Saturday, February 16, 2019. The seminar will start at noon CST. The subject will be trade entries. All clients and interested parties are welcome. This is a no cost seminar. The intent and purpose of this seminar is to gather as many resources about trade entries as we can find and put them into one place for review. We understand how important trade entries are and wanted to have a focused discussion on this topic. The live seminar will be conducted in our webinar room facility that we use every week to conduct our Monday and Wednesday night webinars. Learn more about our forex webinar room or use the direct access link. The webinar room will open a few minutes ahead of the start. We will present about 35 power point slides with various references to our website content, all related to trade entries. We will accept live questions during the seminar. The seminar will be recorded if you are not able to attend live. The recording will also be made available at no cost until March 2, 2019. The link to the recording will be placed on the bottom of the forex webinars page on the Forexearlywarning website. No registration is necessary, just click on the link to the webinar room that we use every week, and we will open the room a few minutes before we start. Or click on the access link above. If you have not reviewed much of the material on our website, review the 35 lessons and videos to the maximum extent possible ahead of the seminar. Before entering the seminar shut down and restart your computer, check you internet connection, and audio/speakers. We cannot troubleshoot anyone once the seminar start. During the seminar the presenter will cue the audience for questions, no interruptions please. Let the information flow and write down any questions or take notes if you like. You should not have to take many notes at all as the presentation is well thought out. Mark McDonnell, one of the owners of Forexearlywarning.com will be the presenter. Questions during the seminar can be submitted by email to our admin@ email box or cut and pasted right into the chat cue using the CTRL-V buttons on your keyboard, wait for the host to announce that he is ready for questions. After The Seminar – The seminar will be recorded and made available free for two weeks. During the two week free period you can review the video as many times as you want at no cost. After that the video will be available for purchase for $14.99. You will be able to purchase our 4 hour forex training video and we will include the trade entries video with the purchase, two videos total for $14.99.